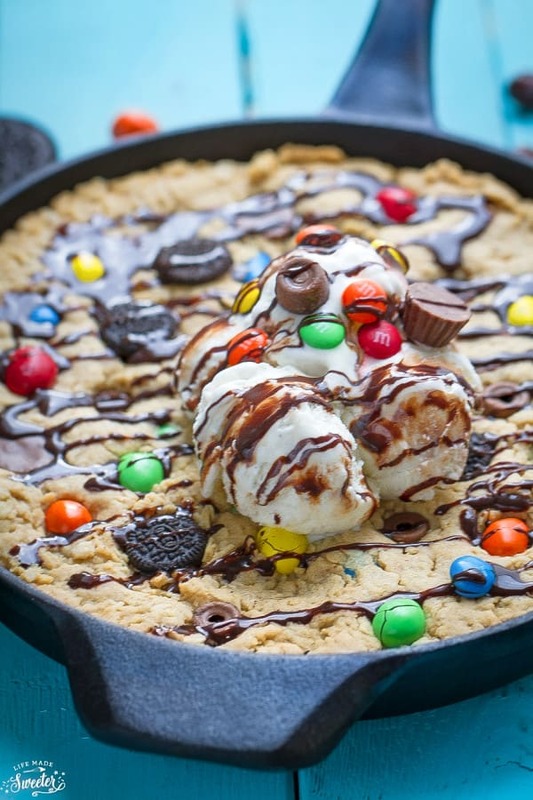 Candy Oreo Monster Skillet Cookie Pizza – a fun dessert perfect for sharing. 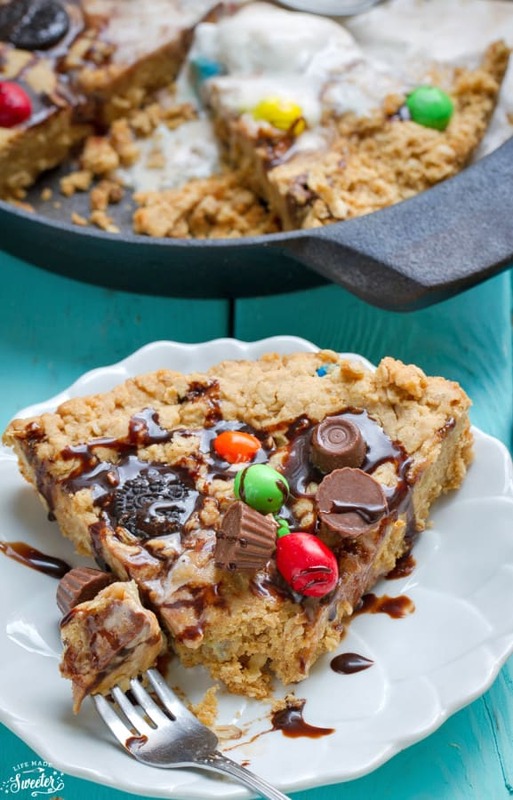 Best of all, it’s easy to customize with your favorite candy on a soft and chewy peanut butter oatmeal cookie base. Do you ever buy too much Halloween candy? I always buy a little bit extra since I am always worried we will run out halfway through the night. Now that we take our son trick-or-treating for a good part of the evening, most of the kids have already made their rounds by the time we get home. 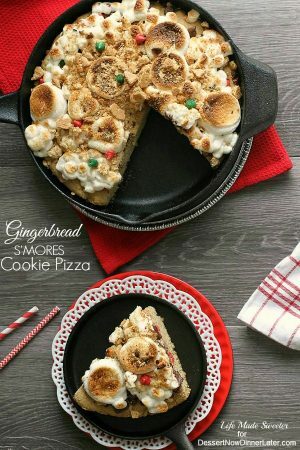 Baking them up in one big giant cookie was just the answer. 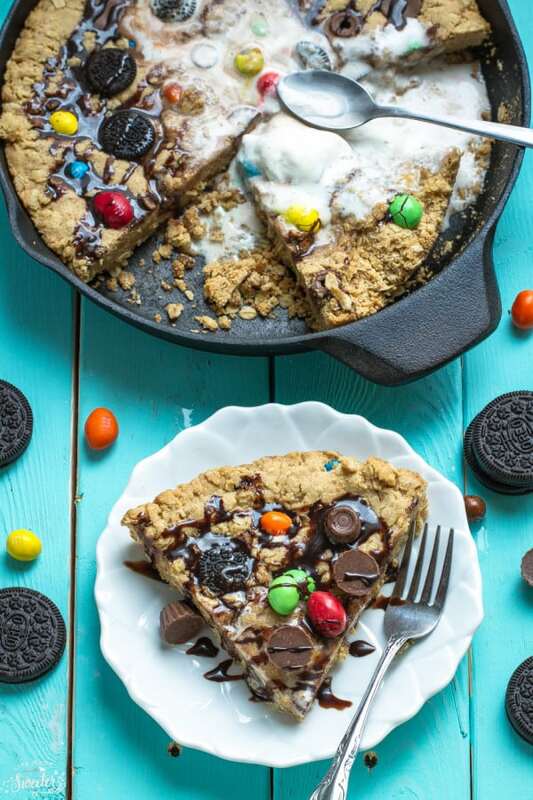 This Candy Oreo Monster Skillet Cookie Pizza is soft chewy and totally addictive! 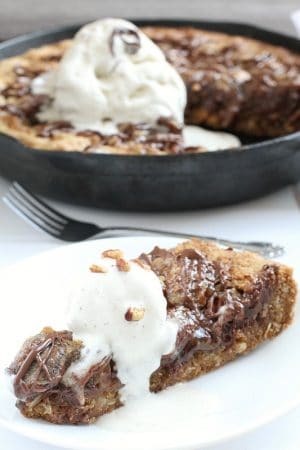 My chocoholic husband declared this the best dessert ever after taking only one bite and proceeded to polish off the entire skillet all by himself. It’s the perfect way to get rid of leftover Halloween candy and comes together in about 30 minutes. You can’t beat how easy it is to make too! No rolling AND no chilling required. Just grab your spoon, fork or a giant slice and dig in! 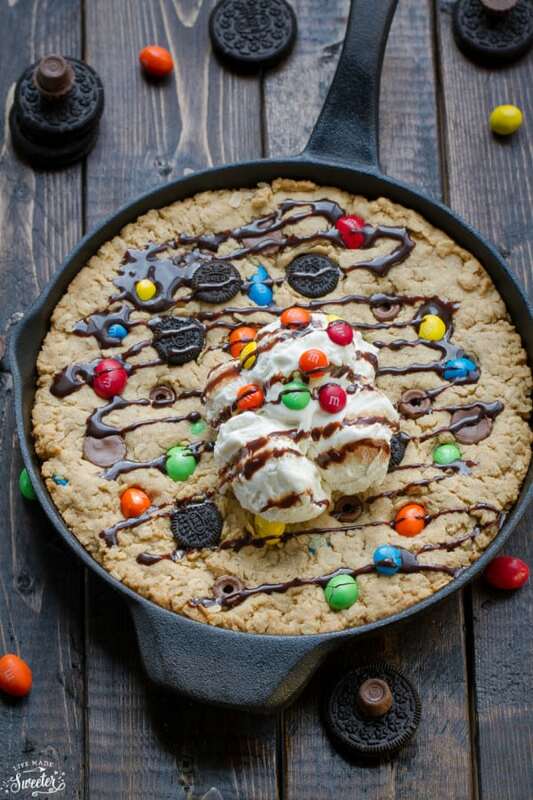 Candy Oreo Monster Skillet Cookie Pizza - a fun dessert perfect for sharing. 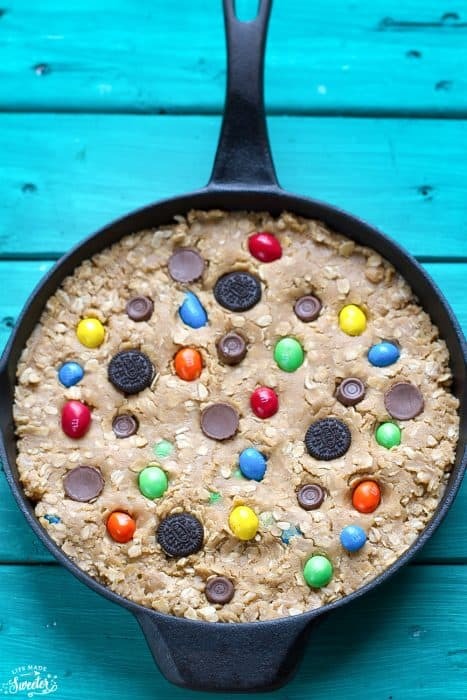 Best of all, it's easy to customize with your favorite candy on a soft and chewy peanut butter oatmeal cookie base. Lightly coat a 9 inch cast iron skillet or cake pan with cooking spray. In a medium bowl whisk together the flour, baking soda, salt, and oats and stir to combine. In a larger bowl, whisk together melted butter with brown sugar and granulated sugar until combined. Whisk in peanut butter then the vanilla extract followed by the egg. and mix until smooth. Slowly stir wet ingredients into dry ingredients. 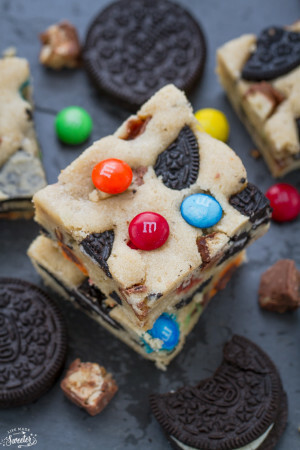 Fold in half of the M&M's and Oreo cookies - reserving the other half for topping. 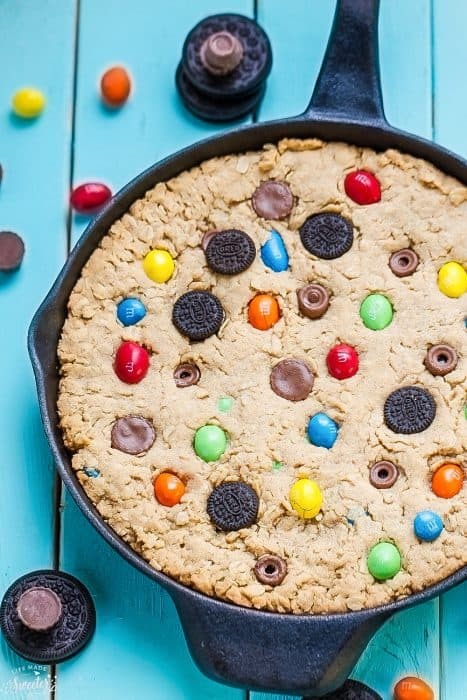 Gently press cookie dough into prepared skillet and top with mini Rolos, Reese's peanut butter cups, remaining candy and Oreo cookies evenly. Bake 22 - 25 minutes or until an inserted toothpick comes out clean.